The end of 2011 is a golden opportunity to participate in an anticipated upside for mining equities, says Tocqueville Asset Management Senior Managing Director John Hathaway. We caught up to him at the Casey Research/Sprott Inc. Summit "When Money Dies" for this exclusive interview with The Gold Report. Hathaway predicted that once investors realize higher gold prices will stick, they will take a chance on the big upside waiting in the junior and senior space. The Gold Report: In your recent article "A Golden Mulligan," you called gold mining equities "a rational way to participate in what appears to be the end game for paper currencies on an attractive risk-adjusted basis." After trailing the metals prices substantially since 2010, why do you think they are ready for a turnaround? 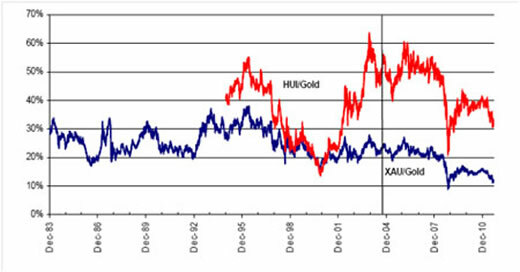 John Hathaway: Gold mining stocks have underperformed for a number of reasons. Gold ETFs created competition for gold stocks even as it made owning physical metal more attractive. Also, as gold flirted with $1,900 an ounce (oz), investors may not have priced that into the stocks as they weren't convinced it would stick. Now that we have had a correction, investor analysis will show that the average price over time, as opposed to variable spot prices, is steadily rising—proof that industry profitability should also be on the rise. The best is yet to come for gold mining earnings as confidence in government monetary policy continues to erode. TGR: We have seen a lot of volatility lately. What price do you predict for gold going into 2012? JH: From years of experience, I have learned never to combine a price prediction with a specific point in time. The gold price will continue to rise until the fiscal and monetary policies of Western democracies undergo severe alteration in the direction of sanity. TGR: What role do operating costs play in equity price challenges? JH: Some companies have cited increased operating costs as a limiting factor in stock price growth, but the facts don't support that argument. Energy prices, one of the most variable costs in gold production, are almost half of what they were four years ago. The same is largely true in everything from steel and chemicals to labor. Margins have steadily increased since 2008 and, unless declines in head grades or increased resource nationalism take their toll on future mine profitability, that margin expansion trend should continue. One of the biggest factors weighing on mining stock prices is probably investor risk tolerance. It goes without saying that mining stocks are riskier than physical metals and a lot of investors are looking for a safe haven right now. TGR: At the end of September, the Tocqueville Gold Fund reported a three-month average return of -8.49% compared to -13.87% for the S&P 500 and a three-year average annual return of 32.24% compared to 1.23% for the S&P 500. Your top 10 holdings include (5.43% of assets) Goldcorp Inc. (G:TSX; GG:NYSE), (3.75% of assets) Randgold Resources Ltd. (GOLD:NASDAQ), (3.33% of assets) Silver Wheaton Corp. (SLW:TSX; SLW:NYSE), (3.07% of assets) Royal Gold Inc. (RGL:TSX; RGLD:NASDAQ) and (2.98% of assets) IAMGOLD Corp. (IMG:TSX; IAG:NYSE). What will be the catalyst that gets investors looking at mining stocks again? JH: I think the release of third-quarter earnings will amaze people. I am very bullish on the future of the price of gold and gold equities. Equities represent extraordinary opportunities because they offer organic growth in resource production and bumps from merger activities that aren't possible holding inert metal. TGR: How will companies that are not making profits at $1,900/oz be profitable going forward? JH: If a company can't make money at $1,300/oz gold, it shouldn't be public. Companies have to find a way to make a profit. An example is Osisko Mining Corp. (OSK:TSX) (which is one of the top 10 in the Tocqueville Gold Fund at 4.49% of assets). It had a $200 million market cap five years ago when we invested; the market cap is now $5 billion. It has a large, low-grade deposit and the price could rise further as they ramp up production. TGR: You mentioned seniors as a bright spot in the investing scene. Please explain the rationale for your portfolio diversification between bullion, small-, mid- and large-cap companies. JH: I have about 7% invested in bullion because it is an anchor of value. Physical gold helps protect against currency depreciation. I have about 10–20% in small-cap companies, 20–30% in mid-caps and 30–40% in large caps. The percentages can vary as the valuations change even though we don't trade very often. Turnover is usually less than 10% in a year. Big caps benefit most from high gold prices because they are actually producing and selling the metal today. It therefore offers compelling valuations, attractive current returns and virtually a free ride on future gains. We own 11 companies accounting for about 40% of global gold production. TGR: Are higher dividend payouts going to be the rule going forward? JH: I hope so. Newmont Mining Corp. (NEM:NYSE) (another Tocqueville Gold Fund top 10 holding at 4.74% of assets) took the lead and linked its dividend to the gold price in April when gold was trading at $1,458/oz. For each $100 increase or decrease in the gold price, the dividend adjusts $0.20 a share. We expect similar announcements to follow from other producers. TGR: For those who choose to invest in physical gold, where is the best place to keep it? In the U.S., out of the U.S.? JH: Any good vaulting service will work. Where it is physically located doesn't matter as long as it is secure, accessible and not in a bank. TGR: Thank you for sharing your insights. For the complete audio collection of the Casey Research/Sprott Inc. Summit "When Money Dies," click here. John Hathaway, senior managing director of Tocqueville Asset Management, manages all gold equity products and strategies at Tocqueville Asset Management. He holds a bachelor's degree from Harvard University, a Master of Business Administration degree from the University of Virginia and is a chartered financial analyst. He began his career in 1970 as an equity analyst with Spencer Trask & Co. In 1976, he joined investment advisory firm David J. Greene & Co., where he became a partner. In 1986, he founded Hudson Capital Advisors and in 1988, he became chief investment officer of Oak Hall Advisors. 2) The following companies mentioned in the interview are sponsors of The Gold Report: Goldcorp Inc., Royal Gold Inc.
3) John Hathaway: I personally and/or my family own shares of the following companies mentioned in this interview: Tocqueville Gold Fund. I personally and/or my family am paid by the following companies mentioned in this interview: Tocqueville Gold Fund.